Crocodiles tire easily when lumbering across land, but they move with speed and ease in the water. Saltwater crocodiles (Crocodylus porosus) are estimated to swim at speeds of up to 15 kilometers per hour. The crocodile's tail is his primary means of propulsion at high speeds. The tail moves side-to-side in a sinusoidal, snakelike, pattern. The tail has evolved for maximum surface area to propel the crocodile through the water. It is flattened vertically like a rudder rather than a horizontally like a shovel, and has scutes -- cartilaginous spikes along the top -- that increase surface area. The crocodile’s body follows this snakelike movement as he speeds through the water, although his body doesn’t move while the tail does at slow, meandering speeds. A crocodile’s legs are used for steering at slower speeds, but they increase drag as he moves faster. At increased speeds, he folds his legs back against his body to reduce drag. For steering at slow speeds and to aid floating, the crocodile has webbing in his back paws that acts similar to a rudder. 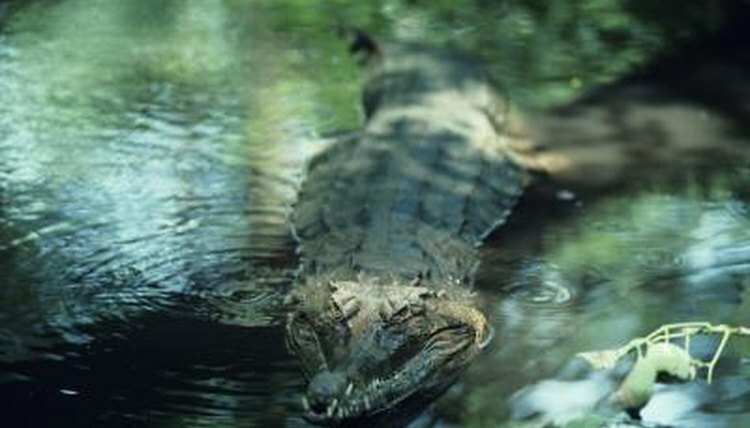 Crocodiles utilize air in their lungs to control how they float or submerge, sinking as they expel air. While the speed of crocodiles might not seem impressive, they can maintain the speed for long periods of time without expending a great deal of energy.